Alice In Chains – the one damn band that makes me restate myself every time I try to claim that the Seattle-scene and the successful heavy rock of the 90s overall was very underwhelming across the board. I love AIC and upon rummaging my shelf for listening this baby came to my hand. 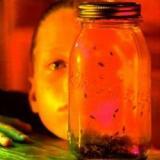 Jar Of Flies continued the band’s “pattern” of releasing a mellow EP after a full-length album, that was established with the Facelift/Sap-succession. A friend of mine said it very well once, that after the downright depressive wrecking ball (and awesomeness) that is Dirt, Jar Of Flies is like the smouldering ruins – a sonic aftermath of sorts. With the exception of some leads and riffs played on dirty distortion, the EP is an unplugged affair with waves of acoustic guitar dominating the soundscape. The mood in the songs is mournful and very personal, sometimes counterpointed what I feel are some joyful and really catchy melodies. The opening duo of Rotten Apple and Nutshell feel like signature AIC-songs just played without distortion. A heavy dirge carries Layne Staley’s tortured croon beautifully and the rhythm section keeps it appropriately low key. I Stay Away features some big string flourishes that complement the ballad really well. The big hit of the album, No Excuses, is probably my favourite off the album, as it is somewhat up-beat and just so damn infectious. Whale & Wasp is a nice instrumental where the electric guitar melodies actually sound a lot like the wails of a whale – some great atmospherics in the works. Don’t Follow brings a really bluesy flavour in with the harmonica and twang in the guitars. Swing On This ends the record with a twisted groove that is jazzy on the one hand, but shifts into a rocking mode with the electrically enhanced chorus. Great basslines are provided by Mike Inez, who entered the band on this recording. For a disc that, according to the album sleeve, was written and recorded during one week in September 1993, Jar Of Flies is one impressive piece of work. Even without the trivia, the EP solidifies Alice In Chains as masters of a very different craft from what brought them to the game. One thing that I think the band seldom gets much credit for is the great vocal harmony-interplay between Staley and guitarist Jerry Cantrell. It’s shown throughout AIC’s career, but it shines especially well on this release. For anyone who thinks rock sucked throughout the 90s, this is essential listening.